Not too long ago I found an ant running around the inside of the bathroom sink. I grabbed a strip of toilet paper and scooped it up, tossing it into the toilet. My momentary bug shivers went away as I looked down into the bowl. The ball of paper slowly unfurled like a time-lapse film of a flower blooming. Out of the center marched the little black ant. Charging ahead and continuing its mission unfazed by its new location or change in atmosphere. It followed the twists and turns in the paper creating a living interpretation of a mobius strip as it travelled underneath and behind then back out front again. Slowly rotating, suspended and weightless. Then I flushed it. Robo-Biff has taken the liberty of customizing his ocular antennae, I see. Makes me wonder what the Queen looks like. The different Biff forms are excellent this week. I take it he stole his picnic from the back of GeckoBiff’s chair? i suppose now that biff will be needing to call the exterminater. or in his time frame, the Terminator. 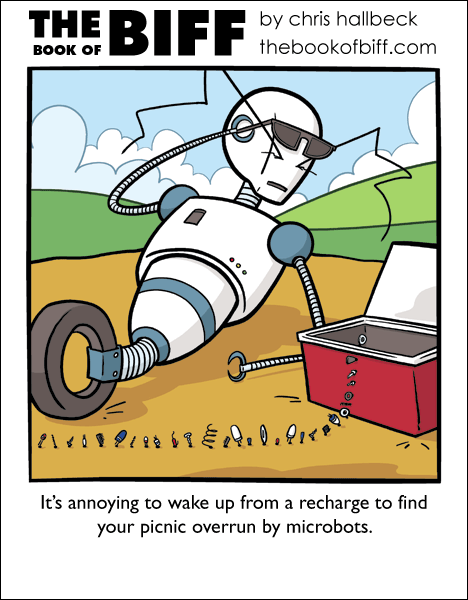 I always take an electromagnet on my robo-picnics. That way I can degauss the microbots when they come for my lubricant and ballbearing sandwiches. A Ro-Biff! I love it! Gizmoduck! At least, he reminds me of Gizmoduck. Gizmoduck, that’s good too. Me though, the first thing I thought of when I saw robo-Biff was an old NES game called Base Wars; anybody play that? Love Biff but have to ask, if the ant was already in the sink, wouldn’t a splash from the faucet have the same end result without wasting the water of a full flush? I suppose if millions of years of evolution were rushing by in the first four days, it’s logical to assume that day five might overshoot the mark a bit. I love the look of RoBiff, BTWay. Ants have that thing of appearing at bathrooms out of the blue. I had bugs crawl across my monitor a few times. Then there was a story of a woman who broke her TV because she saw a bug on it. The problem: It was an Orkin commercial and the bug was part of it. Ha! Another lesson in having a second look. I hadn’t yet noticed what the ants were carrying away. You are (and/or will be) what you eat! Those ants must have really hard teeth to eat metal.